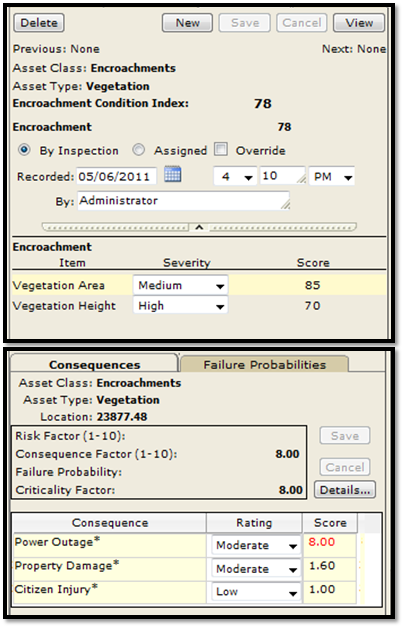 Many utilities collect their infrastructure inspection data using a variety of techniques, sources and systems of record. 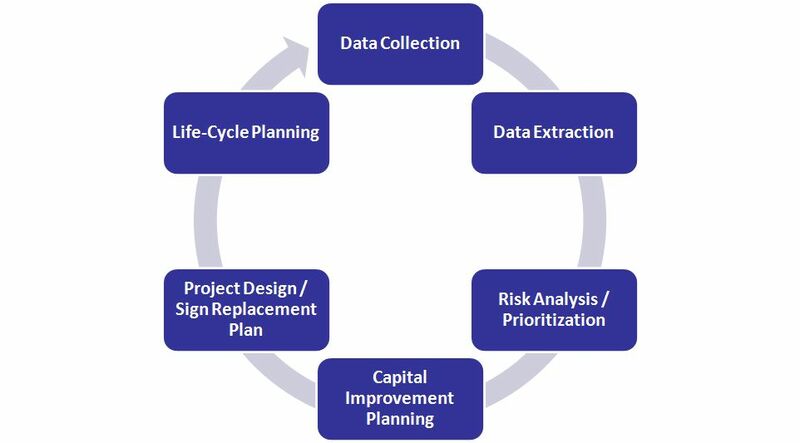 Having many different repositories of digital information makes it difficult to make informed decisions about where to spend operations and maintenance (O & M) and capital project dollars. 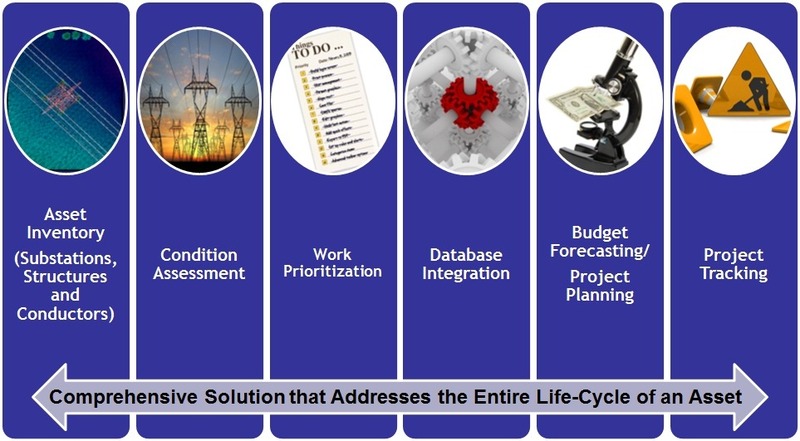 Having a “crystal ball” that aggregates all of this data into one single user interface could help these utilities make more informed decisions for their infrastructure as a whole, instead of using one inspection type to make these decisions. 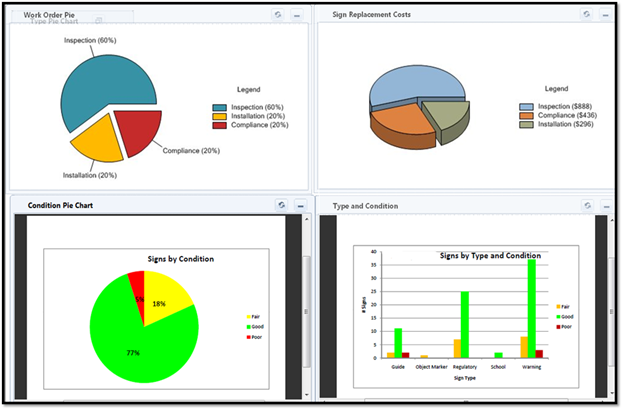 All of these inspections generate a large amount of data independent of one another and can be very useful if combined based on a unique structure or span number. Once combined, this information can then be used to determine the best way to bundle work activities to achieve the greatest return-on-investment (ROI). Work bundling is a concept that has been well understood in the utility industry but not commonly practiced due to the disparate ways in which inspection data is collected and accessed from within a single agency. 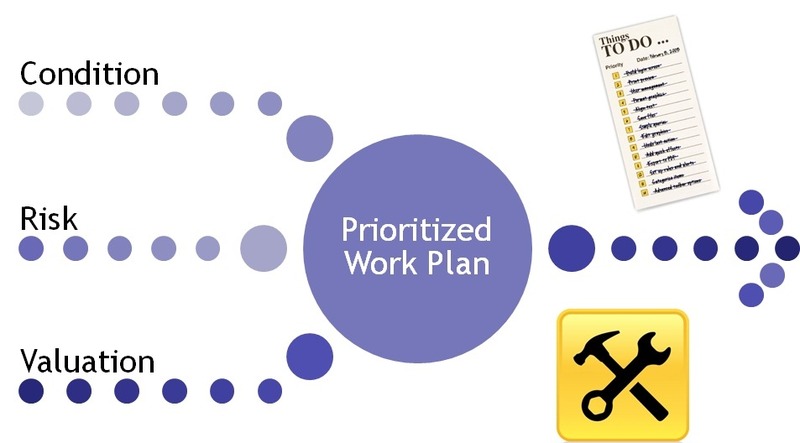 Many work management systems only focus on the recording of work order information related to the labor, equipment and materials used to perform a project, but do not contain strategic planning tools. These tools allow an agency to conduct “what-if” scenarios by applying different budget amounts against a planned work matrix. Once the optimal work matrix is determined, a workplan for that utility can then be planned and programmed, executed and tracked as a project or a series of projects for that planning horizon. 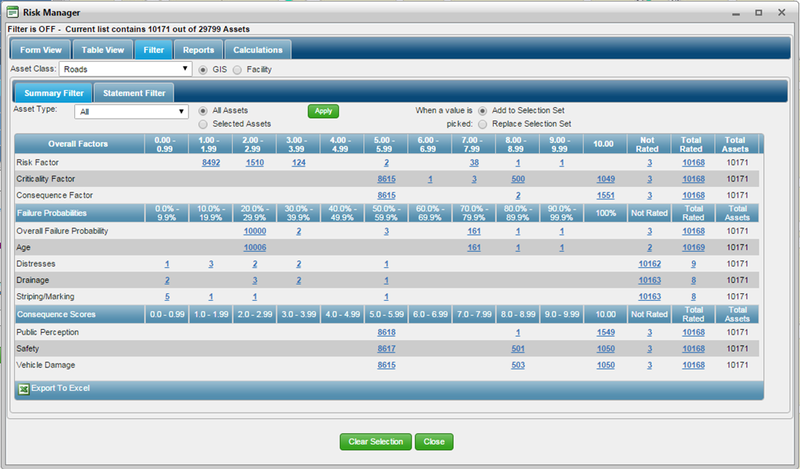 All costs related to that work matrix can be applied to each asset and tracked against an overall workplan budget. 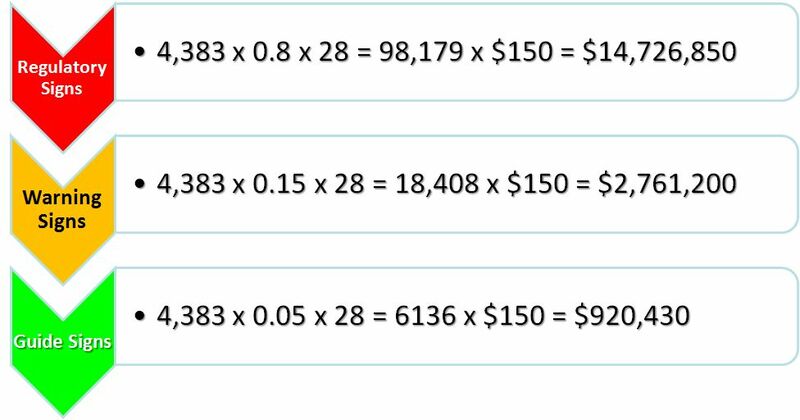 These actual costs are then compared to the estimated costs to refine the planning matrix unit costs that are feeding the budget forecasting model. As an agency completes the work for that particular period, it can then record the work activities against a particular asset which determines its next activity that is due in its life-cycle. As this feedback loop is established, more cyclical work can be planned and programmed for future fiscal years and budget plans. 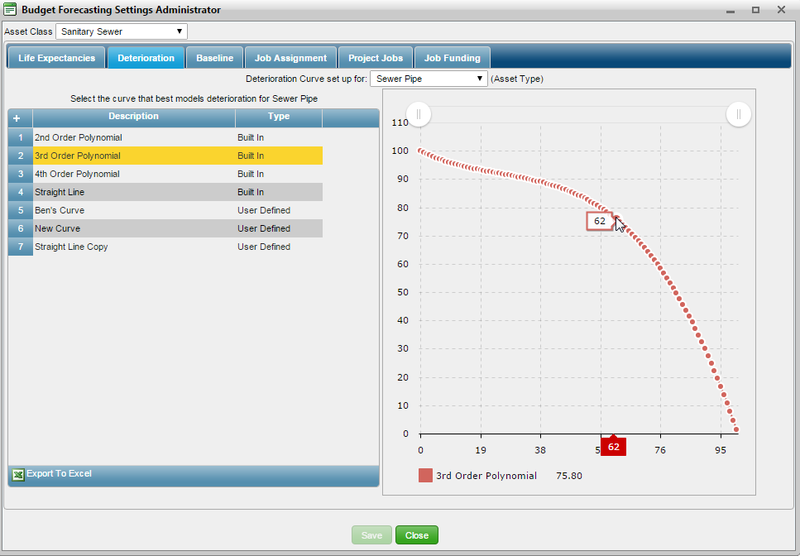 This concept has been applied at many utilities through the US using an asset management software called VUEWorks. 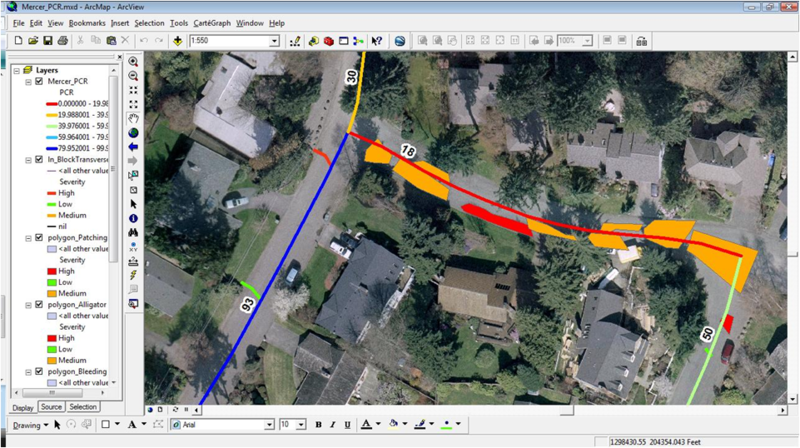 This software is GIS-centric at its core and allows users to connect their GIS data to their asset management system through the use of Esri GIS software. The utility creates a map service which is consumed by VUEWorks and provides a mapping framework from which users can view inspection data from various sources. 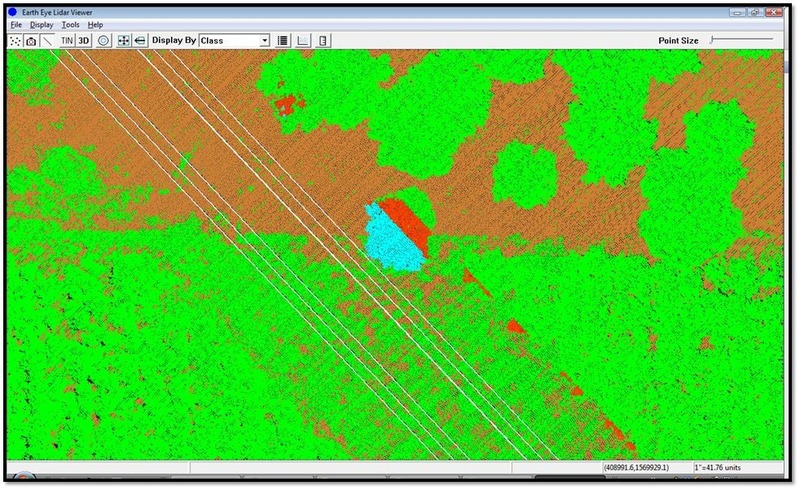 For example, a helicopter inspection company collects CVI data by flying next to the transmission structures and collects high-resolution imagery of any defects located on that structure or its associated span. Another vendor collects walking inspection information which includes subterranean excavations around a structure and its supports. These inspections yield different defects which may require different types of activities to correct them. This is where the concept of work bundling can be used. Since each inspection yielded different defects, the structure or span will need to be worked on at some point. It is important that all departments responsible for line maintenance understand all of the defects present on a particular structure or span so that they can conduct all work activities at the same time. In essence, VUEWorks provides this exact information, all in one place. 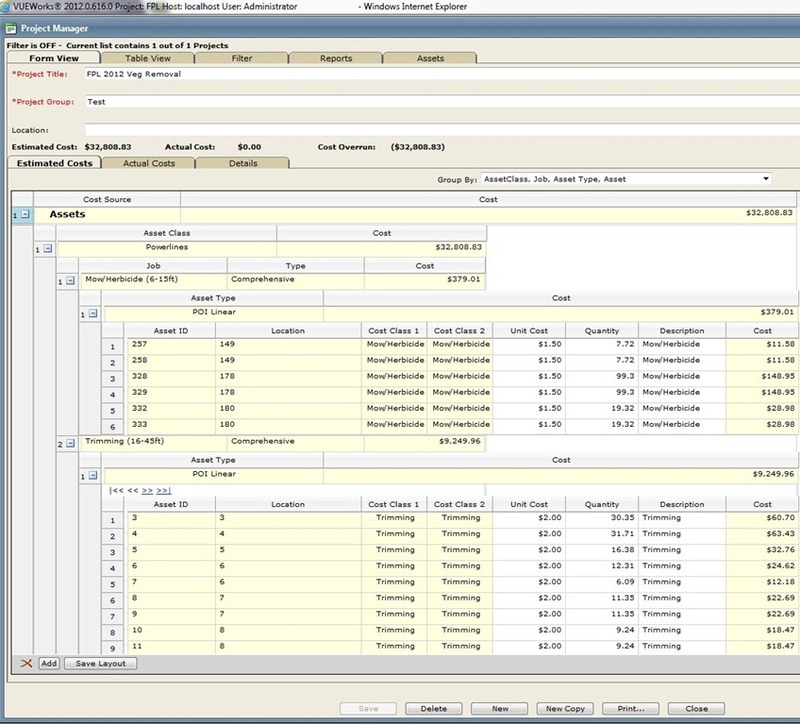 The utility has the ability to link all of this data together based on a structure or span ID and can then view all inspection data from one single user interface. 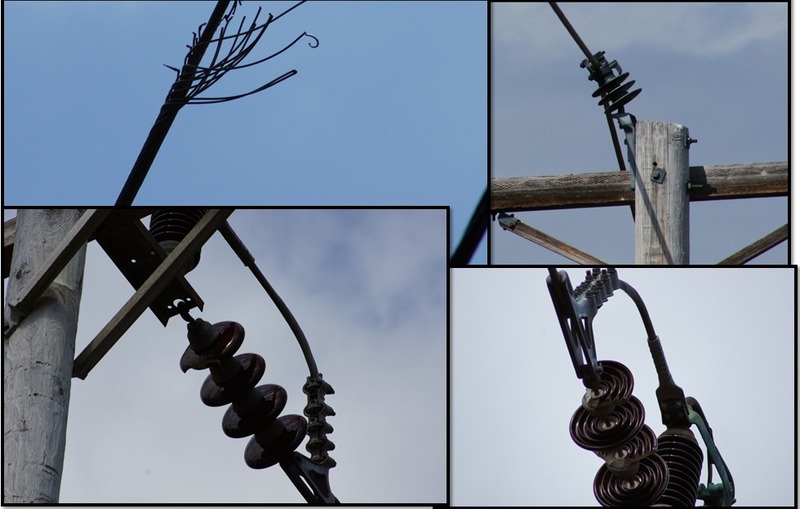 This concept is important because if a utility needs to de-energize a line for maintenance or capital improvements, it will want to ensure that all issues are resolved during one outage. 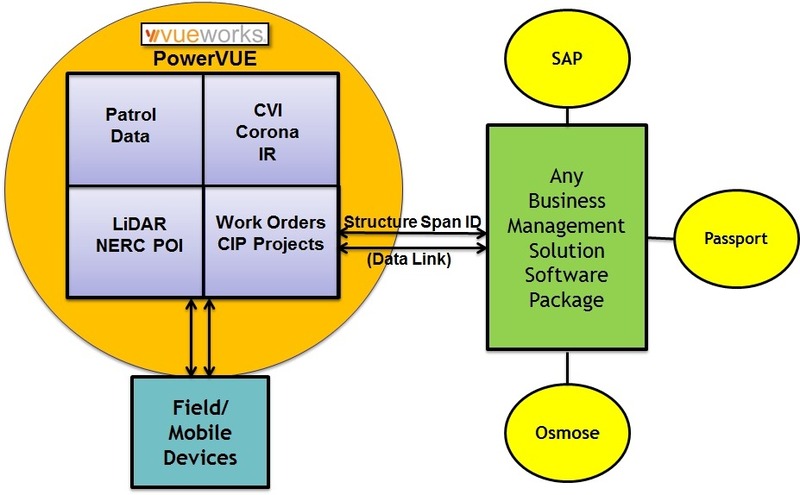 Multiple outages cost money and this concept of work bundling is helping utilities achieve high ROIs for these projects by combining projects into one single project, instead of multiple projects. In conclusion, the concept of work bundling saves utilities time and money through the aggregation of data into a single user repository. This information can easily and effectively be used to make informed decisions and avoid multiple outage situations. 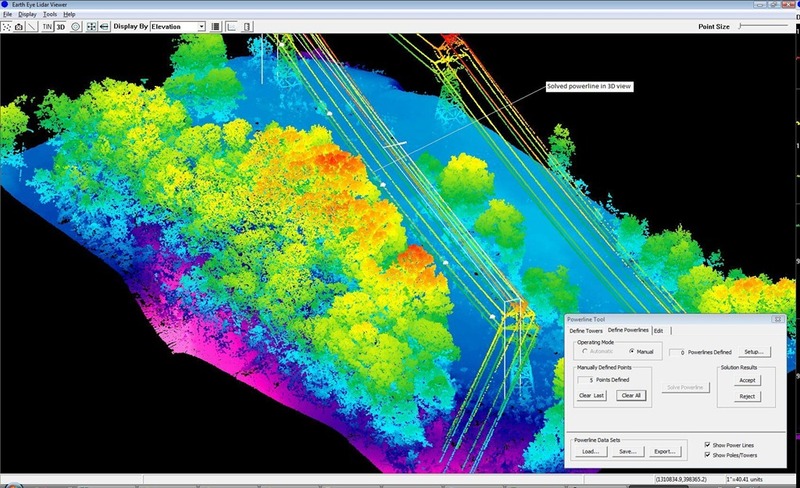 By combining multiple inspection data sets together, utilities can more proactively manage their assets cost-effectively while extending the useful life of their infrastructure investment. 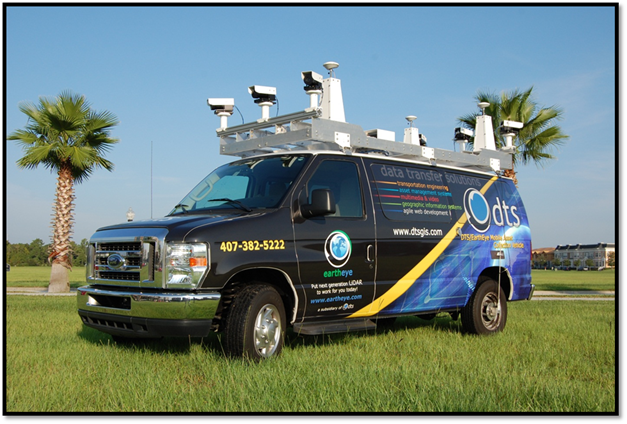 Over the past few years, there have been many projects designed to determine an agency’s sign retroreflectivity compliance across their road network. Each project has been unique in terms of how the agency collected the data and how they ultimately managed the data into the future. 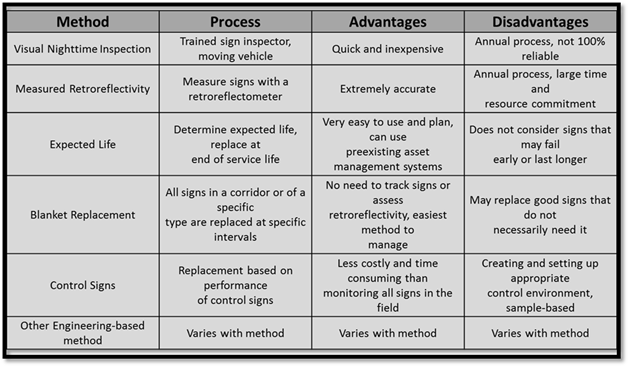 Recent MUTCD regulations require the development of an inventory management program that documents the installation, maintenance and construction characteristics of sign infrastructure. Many agencies are faced with the daunting task of funding a replacement program that will comply with these new regulations into the future. Ultimately, the replacement plan needs to address non-compliance issues that are identified during the inventory/inspection process. The first step in the compliance process begins with an accurate inventory. Signs can be collected utilizing many different techniques and each technique can have its pluses and minuses. Field collection programs can involve inspectors walking the roads, mobile imaging vehicles taking pictures of the roads as well as other collection techniques designed to identify compliance issues along the road. No matter which solution is selected, it needs to satisfy the overall goals and objectives of the project while providing an accurate inventory of the agency’s sign infrastructure. Next, an agency needs to be able to match their available funding to the technology solution that achieves their project goals and objectives. It also needs to understand the trade-offs that are the necessary evil in projects like this – available funding typically dictates the quality of the solution that can be provided by the service provider. Furthermore, the quality of the data collected and its usefulness can be impacted by the choice of the solution and available funding. 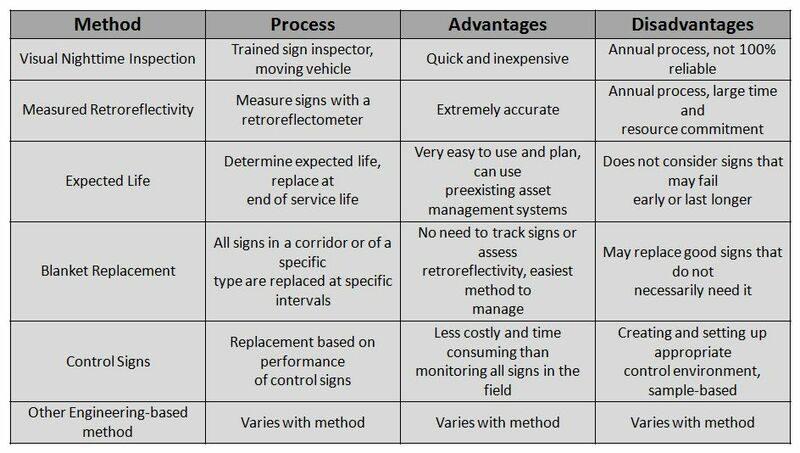 Remember that the ultimate goal of retroreflectivity compliance is centered on the replacement of signs once they fall below the minimum reflectivity standard as defined by FHWA. Many agencies would rather start replacing signs today instead of spending money to create their inventory and a management plan. This makes sense economically in the short-term, but can introduce problems from a long-term management perspective. 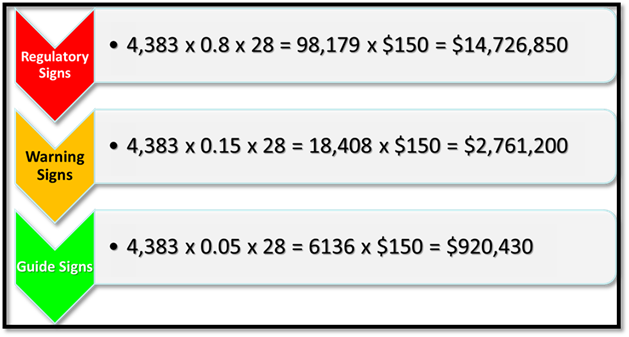 The next graphic illustrates the total replacement cost as calculated using the FHWA “Sign Retroreflectivity Guidebook” for an agency with a 4,383 centerline mile road network. The cost to replace all signs for this agency approaches $17.5 million dollars. Please note that this does not include the cost of the labor, equipment and other material costs incurred for the actual installation of these signs. The inventory of signs for this agency cost approximately $800k or roughly 5% of the total replacement cost for these signs. Although significant, this investment is crucial to ensure the longevity of the Sign Management program designed to manage these assets throughout their life-cycle. The chart below illustrates the advantages and disadvantages related to a few of the FHWA-recommended methodologies. Most of these methods have been implemented in one way or another at various agencies across the Country. The “Measured Retroreflectivity” method is popular at many DOTs and Toll Authorities. I believe this is the case because these agencies typically manage facilities that carry higher volumes of traffic that operate at higher speeds, thus increasing the risk and potential consequences of an accident. Many County and City agencies are utilizing the “Visual Nighttime Inspection, Expected Life, Control Sign, or Blanket Replacement” methods to manage their sign infrastructure. Each mentioned method is used for different reasons (financial vs. headcount) and has a lot to do with legacy management techniques (“We’ve always done it this way”). There really isn’t a management method that can be considered “The Best” or “The Most Cost-Effective”. It is solely dependent upon an agency’s goals and objectives for the management of their sign infrastructure. I typically recommend conducting an inventory first and then implementing a management plan that uses the concepts of Condition, Risk, and Valuation to help prioritize which signs should be replaced along with the best timing for the replacement. This can prove very valuable since the highest risk signs can be replaced first and the least risky signs can be programmed for replacement as funding becomes available. Finally, I also recommend that agencies utilize asset management software to manage the work performed on their sign infrastructure so that all replacements can then be managed according to their useful life and actual condition rating. This information can then be used in concert with one another to help develop a capital improvement plan that details the planned fiscal expenditures for the next 10 years, which is the typical life-cycle of a sign. We’ve built a bunch of new tools centered on pavement crack assessment and we’re excited about how it will increase the transparency related to pavement assessments. 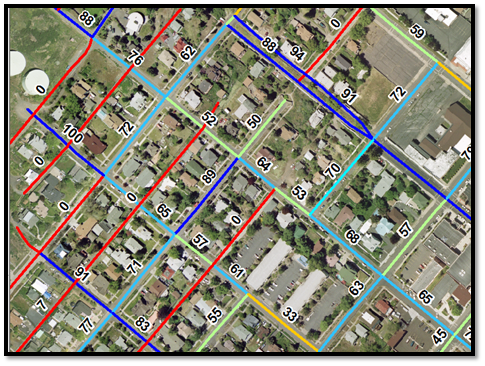 In the past, pavement assessments have been more about delivering segments with PCI values attached to them and less about the actual measurements that were used during the creation of this data. Our clients are always quick to say “We went out and checked a few segments and our assessments were different than what was reported”. This lead to an educational discussion about how the ratings were created and how we applied the ASTM methodology to arrive at these results. Most of the time we all agreed that there was always some subjectivity in the ratings, but that the standard rating methodology had been applied the same way throughout the network. First, we are collecting crack images using a downward-facing 4k linescan camera system with laser illumination. This ensures that all of the pavement images are uniform and are not subject to low-lighting or shadows from natural and man-made features. 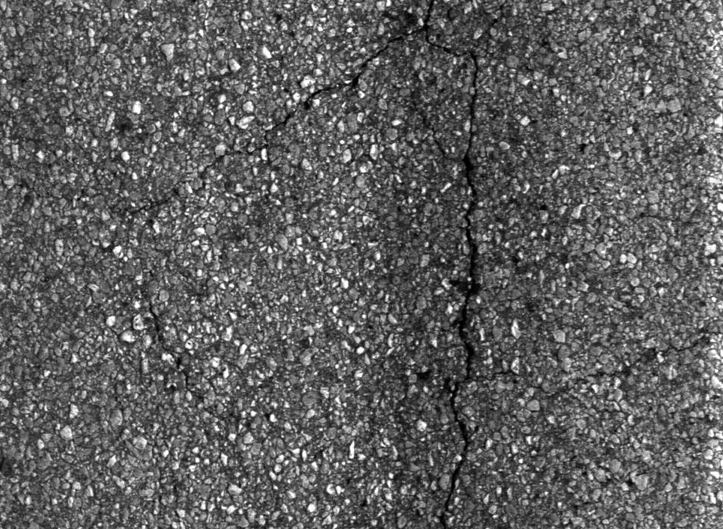 These images are 1mm resolution, allowing us to see the detailed cracking – especially at the lowest severity levels. 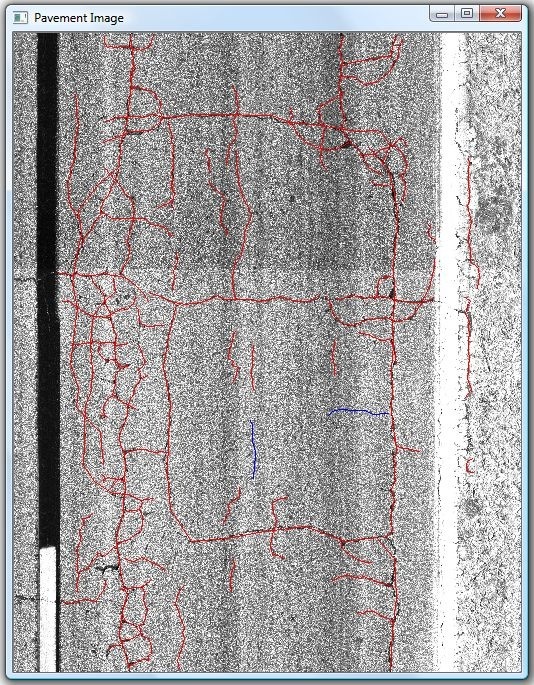 The following graphic illustrates the output from the crack mapping software we are using. Cracks are identified in the imagery automatically from the software and are exported as geospatial points, lines and polygons. The software does a great job of identifying longitudinal, transverse, and alligator cracking. Once we have the initial crack map, our team of compilers goes in and edits the crack maps as needed. Typically, we are editing out false-positives and adding in other distresses as dictated by the scope of work. 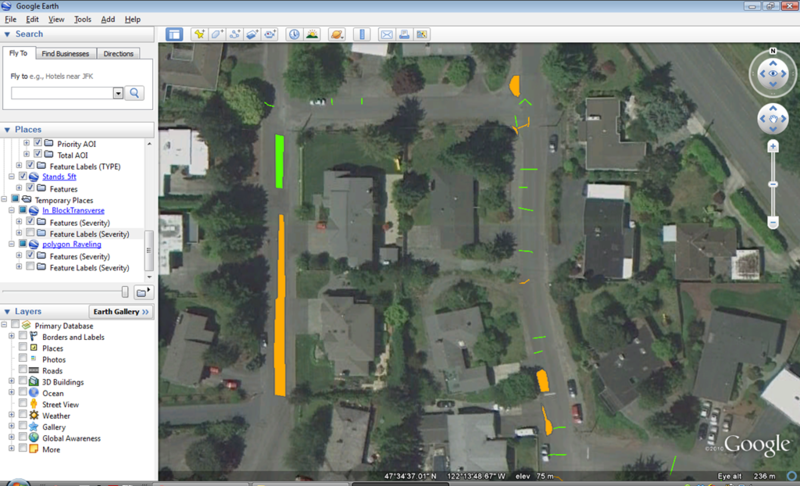 This editing is done within our EarthView software and is completely geospatial in nature. In other words, we can export these cracks, so they can be viewed in a GIS. This is pretty exciting because all of these cracks can be mapped and themed in a GIS based on their severity levels. This process gives the end user of the data a simple QA/QC process that can be used to understand the specific issues related to each segment. Furthermore, this data is then combined with other GIS data sets (Functional Classification, Traffic Counts, etc.) so that a more holistic approach can be taken towards the determination of which segments need in terms of repair methods. 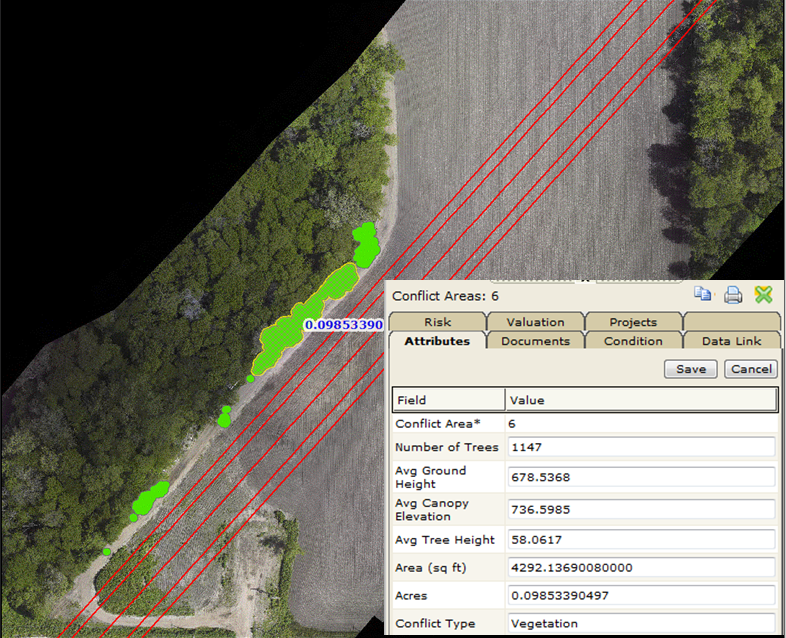 This data can also be exported to Google Earth for easy viewing and display in a non-GIS software. We hope that this provides the end user with more tools in their GIS arsenal to better plan, bid, and execute their Capital Improvement Planning for the year. In other words, our clients will be able to do more with their limited funding than ever before! 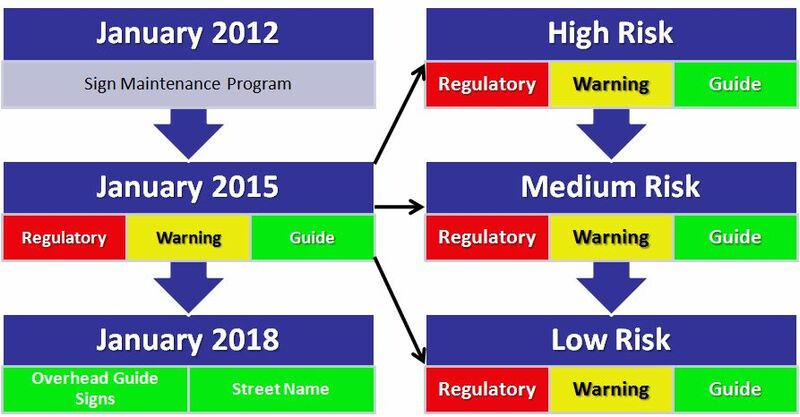 We just completed a sign retroreflectivity shortlist presentation for the a client and discussed the options available for gaining compliance based on FHWA regulations as described in the MUTCD. The client was sold on the “Blanket Replacement” method by a vendor who specializes in sign replacement. I was thinking “what a great selling strategy”, but then I thought twice about it. This vendor had the ability to write their own ticket for selling their sign materials! A great strategy for the vendor, but not a good option for the client. We approached the presentation using a different approach – it combined the concept of risk with the general principles of Asset Management. First, we would inventory their existing sign network to determine what they had and where it was. Then, we would prioritize which areas were the most likely to fail based on the average age of the signs as well as the risk associated with the actual failure (e.g. pedestrian injury or vehicle damage due to an accident). This approach takes into consideration the entire segment of a road instead of considering an individual asset. The client believes that it is more cost effective to replace the worst signs along a segment using a single mobilization of field crews, rather than jumping around and fixing signs based solely on their condition. 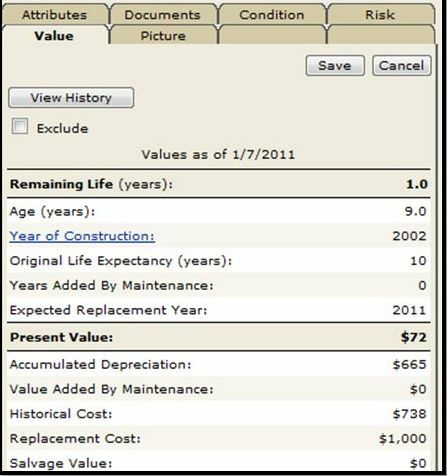 Therefore, we are combining the geospatial location, condition, age, value and MUTCD to develop a risk score for each individual sign. 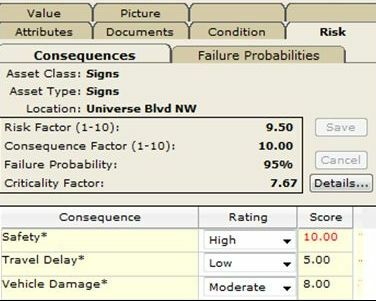 This analysis is used to create the biggest bang for the buck for our client by reducing risk related to accidents caused by failing signs. Since all agencies have to be compliant with Regulatory, Guide and Warning signs by 2015, this approach will support a phased approach while taking care of the highest risk signs and working through the lower risk signs until all non-compliant signs have been replaced or are scheduled for replacement. In conclusion, the use of Risk to support the prioritization of asset maintenance serves an appropriate role in saving clients time and money. By replacing the highest risk assets first, an agency can reduce their exposure to lawsuits related to failing infrastructure. 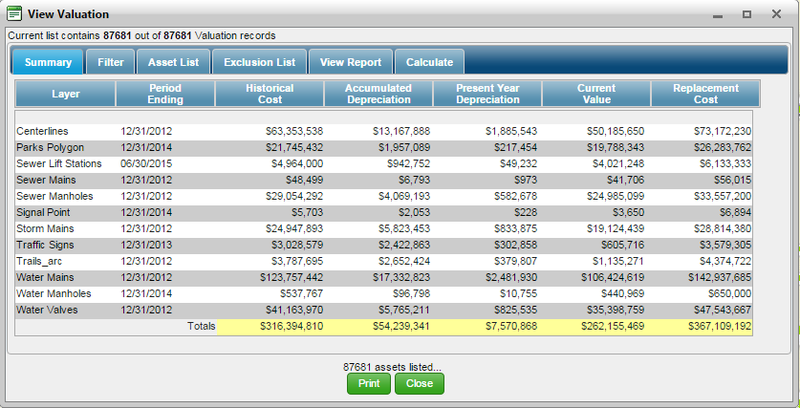 One of the pet-peeves I have with asset management software is that they are basically Access on steroids. There’s not much to the inner workings of the software other than showing you information about an asset – its location, street name, type and maybe some historical information. Once you get past the attributes, the applications get very complicated because they need to handle some business logic and one-to-many relationships, etc. The list of attributes can be exhaustive, but how much of it is useful when making a decision about what to do to an asset with limited funding. I’m working with a vendor who understands this relationship and the role it plays in prioritizing asset rehabilitation and we are getting some promising results. Imagine trying to prioritize which roads you will be resurfacing next year based on their condition alone. The worse condition they are in, the higher priority they will receive when you are ranking them based on condition alone. What if you added risk analysis into the mix? Then, you can ask these questions of your data – If this road fails, what kind of impact will it have on the travelling public? Does the road carry large volumes of traffic, or is it in the boonies? If you can answer these questions, you add another level of intelligence to your data. Start incorporating traffic volumes, functional classification, detour and access constraints into your model and you’re on your way to prioritizing with intelligence.